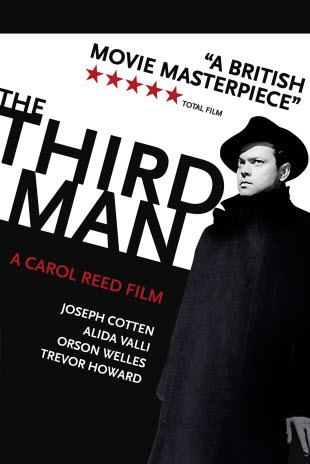 THE THIRD MAN had a lot of heavyweights involved in it’s production. 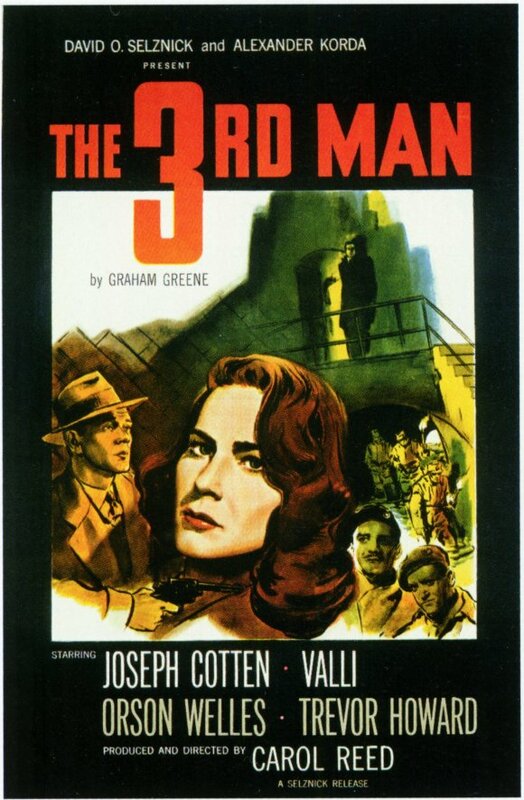 Produced by Alexander Korda, David O. Selznick, and an uncredited Carol Reed, the script was written by Graham Greene from an unpublished novella written first, then released after. Carol Reed directed. The cast had Joseph Cotten as Holly Martins, an out of work pulp western writer who comes to post-war Vienna at the invitation of his childhood friend Harry Lime(Orson Welles) for a job writing for his medical charity. 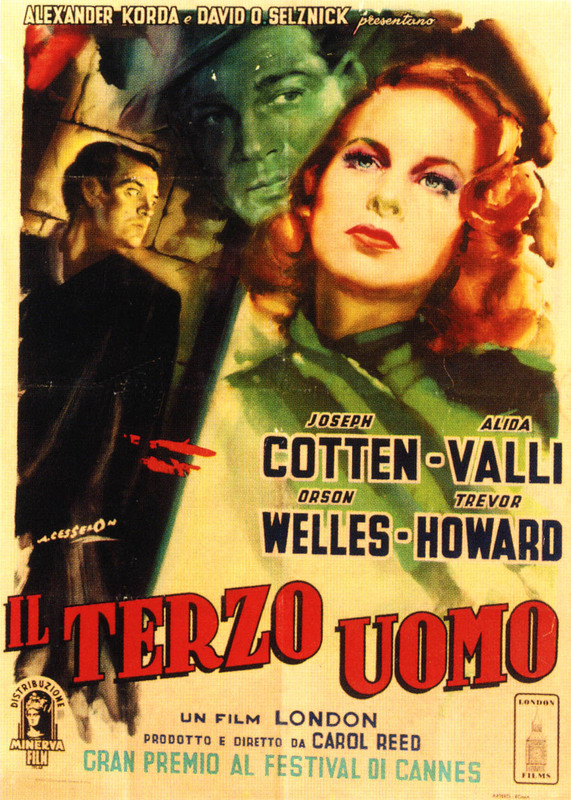 Trevor Howard is a policeman, Major Calloway, and Alida Valli is Anna Schmidt, the lover of Lime. A very young Bernard Lee(M in eleven Bond films) is police Sgt. Paine. Post-war Vienna is divided into four sectors ruled by the four Allies: The United States, Great Britain, France, and Russia. Each is tightly controlled. No walls are up like in Berlin, but access is hard. Holly Martins arrives in Vienna just in time to learn his friend harry has died, the victim of a car hitting him. He just makes it to the cemetery in time for the close of the services where he sees Anna Schmidt walk away and is accosted by Calloway and Sgt. Paine(Bernard Lee) for some questioning. Everyone seems to want him out of the country as soon as possible until he meets a gentleman from a group starved for culture in this former German controlled city. though he’s never heard of him, Paine reveals he’s a writer from the States(Paine loves his westerns). They agree to put him up so that he can do a talk and answer questions. It’s the excuse Holly needs. Something doesn’t smell right. Calloway had intimated that Harry Lime was a racketeer, which Holly didn’t buy though he hadn’t seen Harry since 1939. As he starts asking questions and getting approached by people, conflicting stories emerge. Harry’s doctor just happened to be on the scene, the driver who hit Harry was his own driver. The pair of them carried him over to the side of the road and the doctor says Harry talked glowingly of him before he died, mentioning that he, the doctor, take care of him when he arrives. The hotel porter says he didn’t see the accident, but heard the brakes squeal and looked out the window to see three men carrying Harry over to the curb. 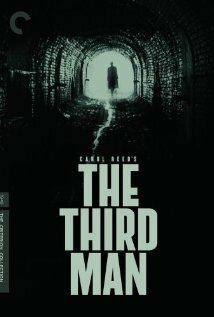 He couldn’t see the third man who kept his head down. It was dark anyway with shadows from the street lights. Who was this third man? Calloway finally shows proof that Holly’s friend harry was a hood. And a deadly one at that. His organization stole penicillin form an army base, actually sold to them by an orderly, now missing, watered down, and sold on the black market. It was used by a group of patients and man died, the lucky ones, others left disfigured. Holly keeps investigating and when he goes to speak to the porter again finds him murdered. The neighbors think he did it and the police have to hustle him off. He’s convinced to leave finally. He wants to help Anna Schmidt though, who he’s sort of fallen for when he’s visited her a few times. She’s in trouble for a forged passport that Harry gave her and is to be deported to the Russian sector. 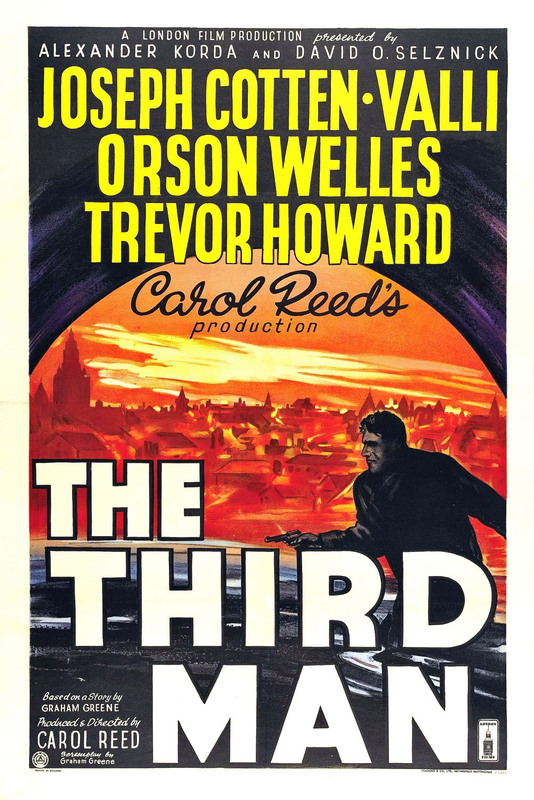 Then Holly discovers who that third man is and everything is turned upside down. The explosive climax in the sewers of Vienna and the completely unexpected ending made for a fine film noir piece. Other places call it a classic and I quite agree. Filimg was done in Vienna and that old world look gave it a better feel than sound stages in Hollywood. A bit on Graham Greene. He wrote the novella to get a feel for Vienna. It was never intended then to be put out for public consumption. The narrator in the novella was Major Calloway. The emphasis was different and the ending was more what I thought the film might be. Boy was I fooled. And finally the music score. Carol Reed didn’t want heavily orchestrated pieces and happened to be in a small club one night when he heard Anton Karas playing his zither. It sounded right and he got the job. As always. check out Todd Mason for other movies and related stuff.